Trump’s message Wednesday night was posted on the day a court in Izmir again ruled that Andrew Brunson should return to prison pending a next appearance, despite recent optimism that his third appearance could see him released on bail. By the time the trial resumes on October 12, the 50-year-old North Carolina native will have been incarcerated for two years and five days in a country that is purportedly a NATO ally. Trump has also taken up the case with Erdogan personally, as has Vice President Mike Pence. The trial is taking place in a country whose autocratic president has overseen a mass crackdown on thousands accused of links to a failed July 2016 coup or sympathies with the man Erdogan accuses of being responsible, U.S.-based Turkish Muslim cleric, Fethullah Gulen. Brunson, who pastored in Turkey for more than 22 years before his arrest in October 2016, is accused of supporting Gulen. Trump’s use in Wednesday’s tweet of the term “hostage” is significant. 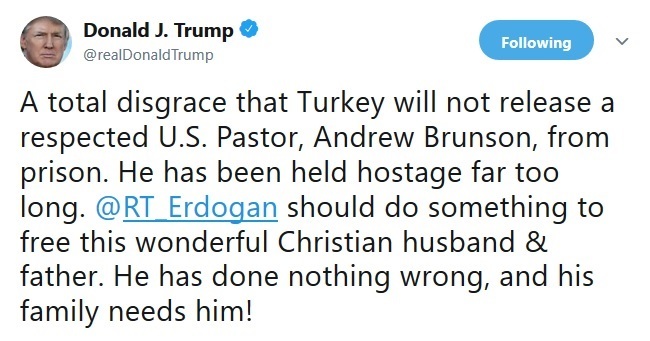 Last fall Erdogan suggested that Turkey could release Brunson in exchange for the U.S. handing over Gulen. That prompted critics to accuse the Turkish leader of holding the American as a hostage in a bid to force the U.S. to extradite Gulen. Brunson is also accused of supporting the outlawed Kurdistan Workers’ Party (PKK) and of using “Christianization” to divide Turks – adding a religious freedom element to the case. He has denied all of the charges, and the State Department says he’s innocent. “The case against him is built on anonymous sources, accusations, and a lot of speculation,” State Department spokeswoman Heather Nauert said Wednesday, calling on the Turkish government “to quickly resolve his case in a timely and transparent and fair manner,” and to release him. The U.S. has not had an ambassador in Ankara since John Bass left last October to take up the ambassador’s post in Afghanistan. His departure came amid a diplomatic crisis over the detention of U.S. mission staff accused of links to the coup, which prompted the embassy to suspend visa services. Also attending was Kristina Arriaga, vice chair of the U.S. Commission on International Religious Freedom (USCIRF). Arriaga urged the administration and Congress to continue to apply pressure, including applying targeted sanctions against the officials concerned. Turkey’s treatment of Brunson has sparked initiatives in Congress designed to punish Ankara with sanctions against senior officials, and efforts to prevent Turkey from taking possession of F-35 fighter jets to Turkey. “Turkey and the United States are longstanding NATO allies and it is imperative to the interests of both nations that Turkey starts behaving like one,” four senators leading the push – Sens. James Lankford (R-Okla.), Jeanne Shaheen (D-N.H.), Thom Tillis (R-N.C.) and Lindsey Graham (R-S.C.) – said in a statement Wednesday.